Geshe Sopa offers insightful commentary on two of the earliest Tibetan texts that focus on mental training. Peacock in the Poison Grove presents powerful yogic methods of dispelling the selfish delusions of the ego and maintaining purity in our motives. Geshe Sopa's lucid explanations teach how we can fight the egocentric enemy within by realizing the truth of emptiness and by developing a compassionate, loving attitude toward others. "Tibetan mind-training literature is rich and varied, as the two poems translated here prove. [They are] full of potent imagery. Geshe Sopa is one of the rare Buddhist studies scholars with a traditional Tibetan education. This top-ranking geshe gives these rare texts the first-rate commentary they deserve." "Buddhist practitioners and scholars will welcome this important contribution to the growing body of Tibetan Buddhist wisdom in English. 'Mind training' (blo sbyong) is the principal method Tibetans use to develop Mahayana Buddhist attitudes; Geshe Sopa's explanation makes these ancient ideals come alive. Also, the historical introduction by Michael Sweet and Leonard Zwilling sheds new light on the formation of the Kadam tradition, and the edited Tibetan texts provide a solid foundation for further study." – Prof. John Newman, New College. "Peacock in the Poison Grove is one of the finest books ever published on the Kadam tradition of Tibetan Buddhism, whose basic program of 'mind training' (lojong) was adopted or adapted by every other Tibetan order. The two long poems translated here, attributed to Atisa's guru, Dharmaraksita, are among the oldest and most dramatic of the mind-training texts, woven as they are of startling imagery and a quintessentially Tibetan admixture of sutra and tantra practices, as well as conventional and ultimate perspectives on the world. Peacock in the Poison Grove provides lucid translations of the texts, and a humane and learned commentary revealing why Geshe Sopa has long been regarded as one of the greatest living scholars of Tibetan Buddhism. Sweet and Zwilling's historical and thematic introduction is a model of textual detective-work and lucid contextualization, which helps us understand the world in which these poems arose and why they continue to speak to us today. 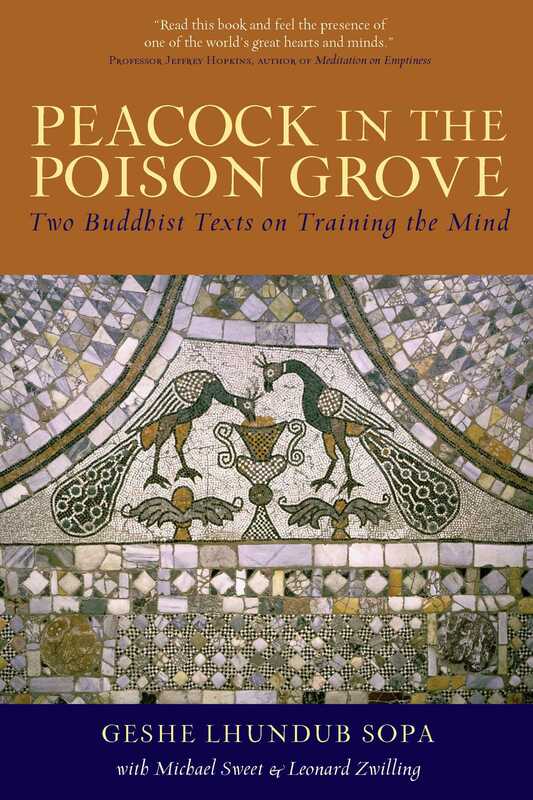 Peacock in the Poison Grove belongs on the shelf--and a readily accessible one at that!--of every scholar and every practitioner of Tibetan Buddhism." – Professor Roger Jackson, Carleton College, author of Is Enlightenment Possible? "This is a wonderful, even inspiring, book meant both for the head and for the heart. The translation of these two classic texts is elegant, Geshe Sopa's commentary [is] insightful, and the introduction provides us with a model for what all historical and thematic contextualizations of Tibetan texts should look like. A magnificent resource for the practitioner and scholar alike." "An outstanding scholar-monk, Geshe Sopa has made tremendous contributions to the understanding of Tibetan Buddhism. It is wonderful his students are making available his teachings." "Being learned, pure in morality, and compassionate, Geshe Sopa is an incomparable example of a Dharma teacher." "Read this book and feel the presence of one of the world's great hearts and minds." "Geshe Lhundub Sopa's character and learning have inspired me from the start of my practice of Buddhism. As is evidenced by his being the first among the top rung of geshes graduating his year, he is a vertiable well-spring of knowledge. His name means 'Spontaneity and Patience.' His training was so sustained and deep that his kindness is spontaneous. His patience over these many decades has been brought to perfection as only wisdom can do. Read this book and feel the presence of one of the world's great hearts and minds. These qualities drew to him two great collaborators, Michael J. Sweet and Leonard Zwilling." "Geshe Sopa is one of the great living Lamas we have today."